If you’re undergoing treatment for cancer, exercise may be the last thing on your mind. A combination of medication, other treatments and bed rest can lead to a sense of fatigue, loss of strength and reduced quality of life, making it difficult to find the energy or motivation to be physically active. However, research has shown that inactivity may increase rates of recurrence for several cancers and may have an effect on survival. It is therefore important that you stay as active as possible during and after your treatment. Exercise has also been shown to improve some of the side effects of cancer treatment. Exercise physiology can help you to find ways to manage fatigue, rebuild strength and endurance, improve or maintain bone density, manage your weight, increase mobility after surgery and improve balance. Exercise physiology is exercise that helps prevent and manage chronic diseases and injuries. Accredited exercise physiologists hold a four-year university degree and are allied health professionals who are eligible to register with Medicare Australia and the Department of Veterans’ Affairs and are recognised by most private health insurers. In a cancer care context, exercise physiologists work with patients to improve strength and endurance, manage weight, provide post-operative rehabilitation and use physical activity to relieve some of the symptoms and side effects of cancer and certain cancer treatments. All exercise physiology consultations at Lifehouse are provided by accredited exercise physiologists with a special interest and experience in working with cancer patients. What will happen to me in an exercise physiology session? At your first appointment you’ll be asked about your medical and exercise history and the impact that your illness and treatment are having on you. This will usually be followed by an assessment which may include balance and strength testing, an assessment of your aerobic fitness and perhaps some questions to find out more about your quality of life and any issues with fatigue. Following this, you and your accredited exercise physiologist will set realistic goals, discuss barriers to exercise and develop an activity action plan that’s right for you, based on your cancer type, the treatments you’re receiving and any other conditions or circumstances that might be relevant. Your plan could include fatigue management, a home exercise routine, a gym program or the inclusion of group sessions such as yoga and qi gong. Small group exercise classes are also run at the Lifehouse patient gym on most days. These provide guidance in a comfortable and supportive atmosphere. Sessions generally include aerobic, muscle strengthening and mobility exercises. Each program is individually tailored and limited to six people. There is very strong evidence that exercise is safe during and after cancer treatment and that it improves cardiovascular fitness, strength and overall health. Evidence from clinical studies indicates that exercise can improve body composition and quality of life, while reducing fatigue, depression and anxiety. Emerging evidence suggests that exercise during and after treatment results in reduced cancer recurrence and improved survival for several cancers. There is also convincing evidence that cancer occurrence is influenced by physical activity levels. A combination of medication, other treatments and bed rest can lead to a sense of fatigue for many people being treated for cancer. It may seem counter-intuitive, but exercise has actually been shown to improve fatigue levels in people living with various cancers. An exercise physiologist can help you to find the right balance between rest and physical activity to improve your cancer-related fatigue. Research also shows that exercise can improve sleeplessness for people suffering from insomnia, especially if the insomnia is related to anxiety. Exercise often plays an important role in post-operative rehabilitation. Exercise can build strength, improve balance, range of motion and flexibility and also enhance your quality of life if you’ve recently undergone surgery. Certain stretches and movements can be used to provide relief from pain caused by restricted range of motion, especially post-surgery. Corrective exercises can also improve your symptoms and pain tolerance as well as developing balance and increasing bone density. When you’re dealing with a cancer diagnosis it’s common to experience feelings of fear and some mild depression. When it comes to the treatment of mild to moderate depression as well as anxiety, research has shown that exercise is just as effective as medication. If your care plan already involves a combination of medications, using physical activity to manage feelings of depression can be doubly helpful, as you avoid further medications (along with the associated expense and risk of contraindications) and can enjoy the other general benefits of exercise as a flow on effect. Increased strength, balance and fitness. Improved range of motion and flexibility. While research suggests that physical activity is important and helpful for people living with cancer, there are a few practical considerations involved when developing your exercise plan. It’s important that you speak with your specialist and get clearance prior to beginning an exercise program, especially if you’re recovering from treatment or surgery. Your exercise physiologist can suggest gentle forms of exercise that are appropriate for you, taking considerations such as fitness level, pain, balance (if you’re at risk of falls) and strength into account when developing your care plan. Other factors including the treatments you’re undergoing, the kind of cancer you have and your overall health will also be considered to ensure the approach is tailored to your needs and safe for your condition. Who is my exercise physiologist? Michael Marthick is the LivingRoom’s accredited exercise physiologist. He holds a Bachelor of Science (Exercise Science) and a Graduate Diploma in Science (Exercise Rehabilitation) from the University of Wollongong. He also completed a Masters of Public Health at Sydney University, before joining Lifehouse in late 2013. 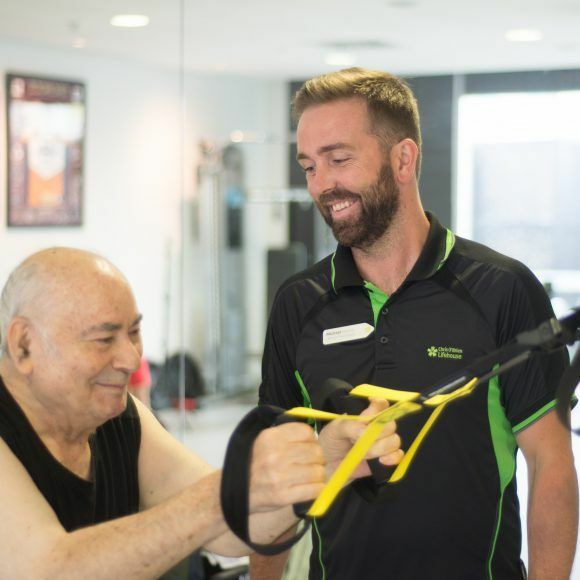 Michael became interested in treating oncology patients when he worked alongside the Leukemia Foundation to develop a specialised post-blood and bone marrow transplant rehabilitation program. He enjoys the challenge of working with a diversity of clients ranging in age from early 20s to late 80s and is excited by the opportunities Lifehouse presents for further research and clinical trials into exercise as a supportive medicine for cancer patients, with a view towards exercise becoming a standard for oncological care in the future. As the LivingRoom’s resident exercise physiologist, Michael collaborates with multidisciplinary teams working alongside dietitians, oncologists, nursing staff and surgeons to achieve the best outcomes for patients, to support their healing and improve their quality of life. Medicare rebates of $52.95 are available for patients who are referred by their GP under a management plan or ‘care plan’. Patients with private insurance can use HICAPS to claim their rebate. Concession and package rates are also available.